Meet Our Exhibitors: BKT • Blackstone Rubber Industries Pvt. Ltd • Bosch Limited • Deestone Limited • Eastern Treads Limited • Elgi Rubber Company Limited • Eternity FZ LLC • M/S Bharaj Machineries Pvt Ltd • Oriental Carbon & Chemicals Limited • Sarveshwari Technologies Limited • SD International • Shandong Linglong Tyre Co., Ltd • Unipatch Rubber Ltd… and more. Pre-register to get your log in password now! 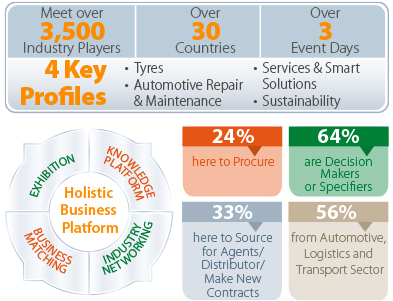 with access to products and solutions in Automotive Repair & Maintenance, Retreaded Tyres, Services & Smart Solutions, Tyres, Tyre Accessories, Tyre Sustainability, Workshop Equipment. provides a fast, personalised and convenient way for you to pre-schedule appointments to make the best of your time at the show. is a series of engaging training and demo sessions to help you increase your knowledge and skills in tyre repair. co-hosted by Tyre Times and Tyrexpo India, recognises the achievements of the movers and shakers of the tyre and rubber industry. 10 June 2016 to enjoy access to all these and more! One of the leading importers of tyres situated in New Delhi, India, RV International deals in a vast variety of passenger car tyre sizes from PT. Elangperdana Tyre Industry, Indonesia. As the sole distributors in the northern region of India for their passenger car tyres brand – ACCELERA, RV International has not only introduced ACCELERA tyres but has also succeeded to make it a reputable brand name in the Indian market.